Ask anyone on Wall Street, “What is the state of the market?” and chances are you’ll get one of three answers: Bull, bear or sideways. To the casual trader, these terms paint a rough picture of where the market is moving. But to a certain concept in mathematics, these terms precisely describe where prices are heading. This concept is hidden Markov models (HMM). It was developed by Harvard Ph.D. mathematician Leonard E. Baum and his co-workers. 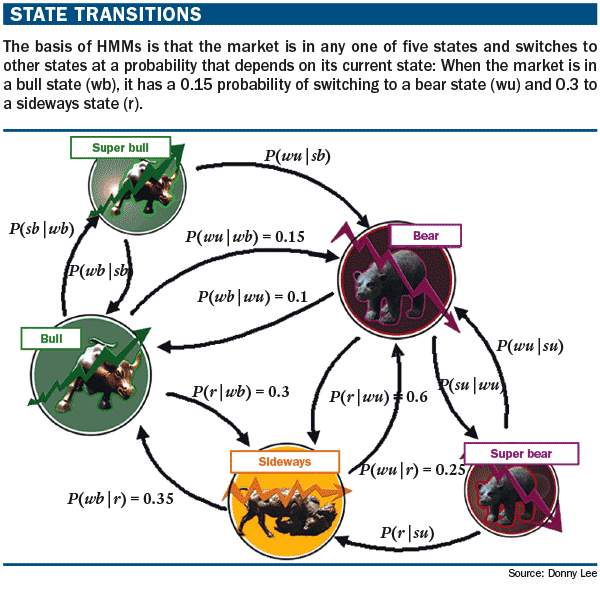 The premise of the model is that the market is in one of five states — super bear, bear, sideways, bull or super bull — at any given time and transitions between states obey the Markov property. That is, transitions are dependent only on what the market’s state was one time interval before and not any earlier. How the market switches between the five states is indicated by transition probabilities that tell us the probabilities of one state transitioning to another. The assumption that the market obeyed the Markov property occasionally was thought of as a good one because it removes the problem of lag. This occurs when a current calculation holds little value because it is based on price action much further in the past. The further back you go, the less of an effect price action should have on current trading decisions. Just as how we know a bear and a bull market behave differently, each state is given a different probabilistic distribution of the observations it can output. Observations are any form of physical quantity we can measure from the market, namely price and indicators. Their uses are two-fold. One, if we know that the market is in a certain state, we can infer from that state’s distribution what the next observation could be. Two, a sequence of observations can be used to figure out the state of the market (see “State transitions,” below).